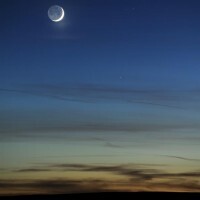 Very pretty sunset on Friday and a classic crescent moon hanging in the sky. The colors in the sky changed by the minute after sunset – it was quite dramatic. I drove further south into the park to get the moon over some of the sandstone hills. 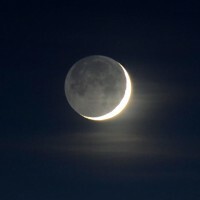 At one point, as it became darker, you could see the crescent lit directly by the sun and the rest of the moon illuminated by earthshine, the sun reflecting off the earth. If you look at the moon photos, it’s easier to understand. I went to two locations that had big collections of petrified wood to see what it looked like at night and what exposures I would need for my camera. The sky in the southern part of the park is very dark, but I still saw a bit of a glow in the air and on the horizon from lights of nearby towns. 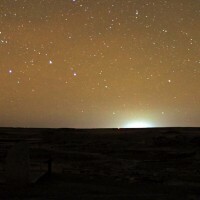 Looking north, I saw the Big Dipper on the horizon, and a bright glow obscuring a few of the stars in the dipper. I couldn’t figure out what town might be there. Later, as I drove out of the park, I passed Santa Fe Railroad tracks that cut through the park and realized where the light came from – some sort of brightly lit depot. This was a big surprise. Walking through the petrified forest at night is an experience. The wood is strewn about in a random fashion, from small bits to tree-size logs or portions of logs, as if someone had started to cut up fallen trees for firewood, then decided to stop. My flashlight shines on the rock, and sometimes I see multi-colored crystals in the formations. I miss the dramatic sandstone hills in the distance that I see during the day; it’s just blackness at night. 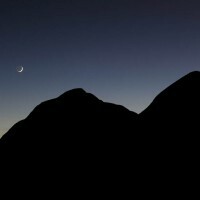 The moon will set later the next few nights and should light up the landscape after dark.